I’ve been cooking a lot with sprouted whole wheat flour lately, and I find it great fun to work with. A nice change of pace from sourdough everything- all your soaking (sprouting) is done before grinding the wheat into flour, so the flour is then ready to use immediately when the mood strikes. Pancakes, muffins, and quick breads are ready in minutes with sprouted wheat (or other grain) flour! Sprouted flour tastes a bit sweeter, so less sweeter can be used with the same results. We love the dense sourness that comes from sourdough, and are also enjoying the lighter baked goods that come from sprouted flour- it’s a nice variety. Making sprouted flour at home was one of the main reasons I wanted a dehydrator and grain mill. 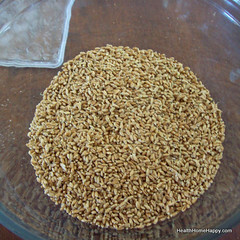 I followed the easy sprouted flour directions that Nika provided on her blog- it’s a simple process of sprouting, dehydrating, and grinding the grain into flour! 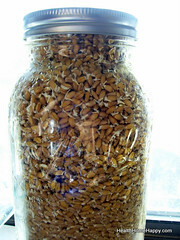 1: Using a jar with a sprouting lid (if you’d like to improvise, you can use a bowl and rinse your sprouting grains in a sieve during sprouting), fill 3/4 full of wheat berries, or your whole grain of choice. I’m using a half gallon jar here, I normally do two of these at a time. 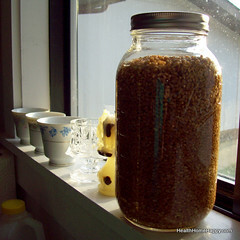 2: Fill the jar most of the way to the top with filtered water (cover the wheat berries well) and allow to soak overnight. 3: In the morning, rinse well with filtered water. Allow to drain. I leave mine to drain in a loaf pan between rinsing. 4: Continue rinsing and draining every 8 hours or so until your grain starts to sprout. I normally do one full day of sprouting. 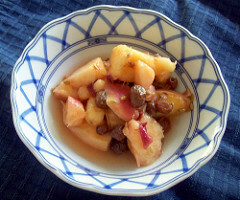 The wheat berries pictured at the top were sprouted longer than necessary, it isn’t necessary to sprout until their tales are that long- just barely emerging from the end of the berry is fine. 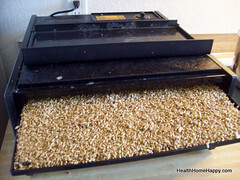 5: Spread the freshly sprouted wheat onto dehydrator trays, or onto a shallow baking dish to place in the oven. Dehydrate (I use the ‘medium’ setting of the dehydrator) overnight- you want to make sure that the wheat is very dry so that it doesn’t clog your grain mill. 6: Gather your dried wheat berries, and freeze or process into flour. 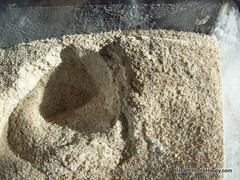 7: Grind your wheat berries into flour as you normally would, using a grain mill or Vitamix. 8: Bake with your flour in any recipe calling for whole wheat flour, or keep it in the fridge or freezer until ready to use. Do you want to use sprouted wheat flour but don’t want to grind it yourself? See my Resources Page for places to buy. 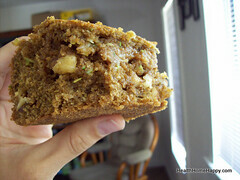 I’ve started to experimented with sprouted flour, and I find it rather gritty and heavy. Do you have any tips on helping it to be lighter? Hmm, I’m not sure. I use it in pancakes, quick breads, and yeast breads and haven’t noticed it being more heavy than regular whole wheat. Are you making your own? We grind it pretty finely. I realized this was post was done awhile ago, hope you get this message. I have been experimenting with soft white wheat sprouted berries. Whenever I used the flour from it, my cookies are quite crumbly, as with my pumpkin bread and corn bread. I grind the flour quite smooth, I don’t understand why it is so crumbly. Any ideas? Hmm, I’m not sure! I might have to try making sprouted wheat cookies and see how they turn out. I’ll try a batch with 100% sprouted wheat, and one with 50/50 white flour and sprouted wheat and then post the results. I understand that when sprouting wheat for too long it won’t have enough gluten left in it to hold together when baking breads, cookies, etc… the information I have always used is to soak for 12-24, then put it in a stainless collander for 12 hours ~ no longer or you loose too much gluten. Sounds like this could be the issue?